Customers may have recently noticed some changes at South Bank station. The awning attached to the station building on Platform 1 has been removed to allow initial construction works on a Transit Orientated Development to begin. The works will include removal of the existing ticket office and toilets with temporary facilities to be installed until the development is completed by mid-2016. The development when complete will provide customers with improved entrance and access points from Grey Street and a new ticket office and toilet facilities. 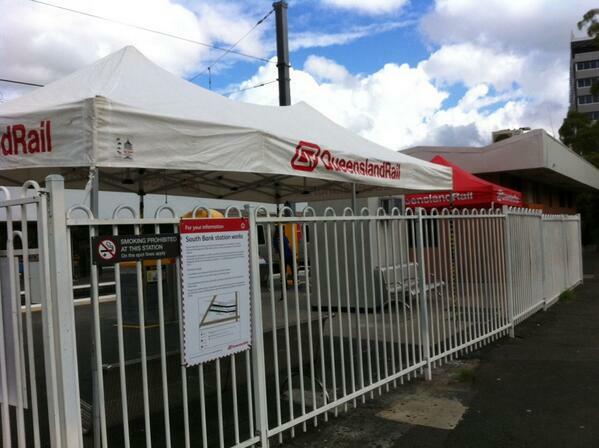 We have listened to customer feedback and installed temporary shelter on the station platform yesterday. We appreciate your patience while we deliver you a better station. Would be nice if they include a direct pedestrian access to the busway station with train/platform PIDS . Too many times PAX have run from the busway to the train station platform only to find they are on the wrong platform ( particularly for GC services ) and sometimes end up missing their service. It actually can't be any more direct than what it is. There would need to be ether an overpass or an underpass. The current setup is effectively an underpass. There is already a display at the entrance to where platform 2/3 is (underneath the rail lines) - however it could be improved. Having the two stations more "integrated" in some way is a good idea. Perhaps both bus and train displays underneath the bus platform? Sometimes commuters may not be sure whether the should catch a bus or train - so it'd be good to have one location where they could work out which way to go. Yes, agree. A central set of PIDs to display all options is an excellent idea. @burntpineapple Yo. Works about to start for South Bank TOD, old structure had to be removed to facilitate the construction. Access to South Bank station, platform 1, from Grey Street, South Brisbane is temporarily closed due to construction of new facilities. Customers requiring access to Platform 1 will need to use the lift located on Vulture Street. Lift 1 on platform 1 at South Bank station is out of service. ^ It's only been there a month or so, and only will be there for another month or so until the system is open and the bus routes are permanently rerouted away from that stop. Access to South Bank station, platform 1, from Grey Street, South Brisbane is temporarily closed due to construction of new facilities. Customers requiring access to Platform 1 will need to use the lift located on Vulture Street or via the ramp access, running parallel to platform 1, from Tribune Street. I'm glad they confirmed that the ramp to Tribune St would remain open. A number of updates are now available on the QR website. This includes the construction of stairs at the city end of the platform to Tribune Street - and the subsequent closure of the ramp. My concern now is that this will be a temporary measure - and that Go Card readers won't be installed at this new entrance. This would force everyone to walk half way up the platform to use existing Go Card readers. I've commented on QR's Facebook post asking about this - but as it's the weekend now they probably won't respond until Monday. South Bank is seriously lacking in readers - especially now that there are a LOT more trains heading south during peak (thanks to the new timetable). This includes EVERY train from Ferny Grove and Shorncliffe. There are a LOT of SBIT (and maybe Griffith) students now using trains and not buses - detraining at South Bank. I deliberately position myself at the door closest to the readers at the exit to the ramp to Tribune St. Any other door and I'd be waiting at least 30 or 40 seconds in the queue for the 2 readers. I hope that they install proper fare gates or a LOT more readers as part of this development. ^ Most of the light rail stations have 10 or more each, so they have obviously learned from (if not actually corrected) the mistakes made with the rail network. All good in theory to put in gates, but impossible unless they move the ticket machines off the platforms. Currently the only one is under the bus station with a permanent 15 minute line. Where on earth could they put one for platform 2/3 coming from Tribune street? Yeah it's a bit of a logistical nightmare. 2/3 from Tribune St could have a machine in the approach to the underpass - with gates a little closer to the lift. But then you also have to allow for the ramps to Vulture St - perhaps with a ticket machine on Vulture St. Then you also have the issue that you have to touch off and on again if you want to change platforms. Tempoary ticket office and temporary toilets (not in use yet). There's one on the other side of the street. . . The whole footpath is now closed and will remain so for the period of development. They've erected some fences since I took that photo. You cannot walk along the footpath on the train station side. You have to cross to the other side and back again. If you're approaching from South Bank, you must go to the bus station side and then back again - through the underpass for 2/3 or up the stairs for platform 1. Despite the fences, no one will bother crossing over if they're already on the train station side. They'll simply walk along the edge of the road. Edit: As of this morning the stairs still aren't open. QR's tweet was premature. The temporary toilets are open though. From memory though the single lane each way is pretty wide isn't it though? If they wanted to make that a semi permanent set up it wouldn't take much to have them remove the existing road centerline, shift if over a bit so you have 2 narrower lanes on the busway entrance side and can mark off a pedestrian area on the station side. That said though, traffic on that street is (in my experience) pretty low so the risk of walking on the street is fairly low. Kinda defeats the purpose of there being a footpath there though. IMO what they should have done is sent it 180 degrees the other way and come out at the top of the stairs viewable in the far left. No disruption to footpath. Hence why its temporary. There are other things to worry about in life than where's my limited footpath gone. TBH there is a reason why and it has to do with the number of people and that small road (distances to intersections/driveways/traffic islands/laws etc). Doing as you suggested raises more issues when it comes to foundations in the dirt and liability such as angles and gradients. Actually having another think about this, my guess is that once construction actually commences, the entire footpath will be closed from the Grey St corner to the stairs. This will allow the entire footpath for construction vehicles to enter/exit in safety and without disrupting traffic on Grey St. This is probably also why the stairs go under the overbridge instead of out the other way. Exactly right Derwan. That is what is going to happen. All pedestrian access to the station will have to walk up the busway side of Tribune Street until they come to the pedestrian crossing opposite the entrance to the (train) station subway, and then will cross there. There will be construction site access between the stairs and Grey Street, so that stretch of footpath, and the whole Grey Street footpath up to Vulture Street beside the site will be closed. Temporary stairs are now open and the footpath is closed to the corner. But both this morning and this evening I saw people walking along the road instead of crossing over and back. Thanks for the updates Derwan. Much appreciated ..
Panorama of the rather different-looking platform 1 at South Bank. Temporary stairs to Tribune St on the far left. Existing ramp to Vulture St on the right. Temporary toilets and ticket office to the right before the ramp. Tender has gone out for "Design Development Services for South Bank Station Platform 1 Upgrade". Let's upgrade one platform and let the other 2 look old and tired. 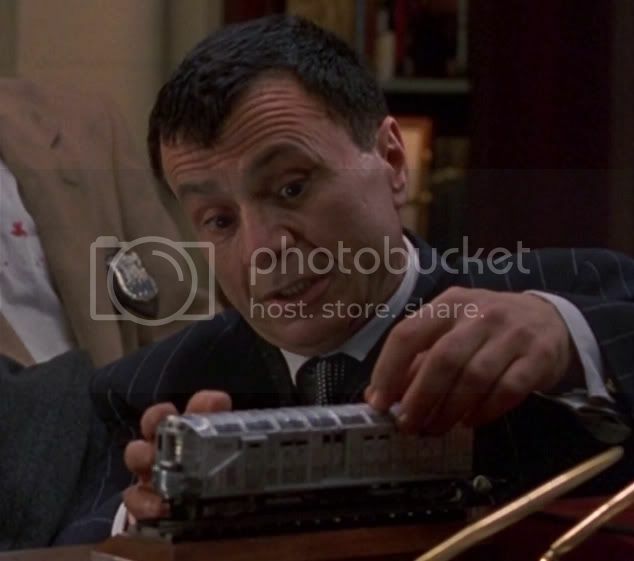 Just like what they did to Milton station. Platform 1 looks modern and stylish, Platforms 2+3 still have the station buildings which have been there for decades. Some photos of the new entrance and ticket office at South Bank that opened today. ^^Good pics. Yeah noticed that on Sunday arvo (Escalators going etc....)The new Retail precinct has been delayed for a month apparently. Woolies along with other stores will be opening early February 2017, instead of early January. ^ Lets hope they re-introduce the 2nd go-card reader at the bottom of P1 ramp. The queues can be horrendous. Surprised that fare gates have not been installed in the main entrance. Oh well, this is Queensland. I wouldn't be surprised if fare gates get installed once construction gets closer to completion (it is still a construction zone). A bit like Fortitude Valley station when while construction was underway for the upgrade, they had normal Go Card station readers, but later fare gates were installed as construction neared completion. In addition to this my source is still adamant they plan to raise the platform level, even though there are no signs of this happening at the moment.